2015 was a turbulent one: the massive transnational mobilization to block the ECB opening in Frankfurt on a weekday as well as the powerful OXI in July gave us a spirit of change and let the possibility to widen the cracks in the system become tangible. It’s needless to remind of the unprecedented level of authoritarian rule whereby the EU erased the option of any alternative to its neoliberal governance and austerity regime. This oppression was primarily exerted by the German government, manifesting its new role within German-Europe. The new form of European governance seems to decreasingly depend on the formation of a social consensus, both with regards to the supra-national institutions and the “centre extremism”-led governments. Last summer also brought about a new, truly transnational movement: practically overnight and at least temporarily the refugees‘ movement pulled down the borders of Fortress Europe. This was accompanied by a wave of solidarity and emergence of “welcome initiatives” basically everywhere. At the same time, we are also experiencing a right-wing racist backlash of a new quality that reaches deep into mainstream society all across Europe. In this situation we can speak of an unprecedented level of social polarization. We do not know exactly what the next months and year will bring. But we know for sure that neoliberal capitalism is not at its limits, thus we should not be either. The neoliberal shock waves across the EU foresee a redefinition of the European political space, captured by the authoritarian rule, state of emergency and class war amongst the lowest social classes. The socio-economic developments will continue to challenge Blockupy. Blockupy is unique and should not be given up easily. As a hybrid coalition between movements‘ organisations, parties and unions it managed to synchronize the heterogeneity of national crisis dynamics. During last years, it has been the only actor able to transform its radical criticism and political imaginary into collective disobedient mass actions on the street on a European scale. It is the only international actor posing the question of power in the European space – a first experience of transnational organization. Blockupy has become more than the many years of political work, more than its transnational coalition, more than a European campaign or a big event. We have reached a level of social acceptability and a dimension of reference unprecedented. A similar project is currently not in sight on our political horizon. From the years before we know however that we need continuity as much as new inspirations in order to go on and take the next steps. Austerity is not over but it became normalized in our lives, that is why we need to update our means of struggle. Let’s be prepared when the European power bloc strikes back again: transnational, disobedient and anti-capitalistic. The ruling political and economic elites seem to have found a way to defend yet again their power: they fuel the right-wing and racist threat by exploiting the question of provisions for refugees and migrants in order to legitimize further austerity measures and intensify the distribution of wealth from the bottom to the top. The impoverishment and precarization of large parts of society and the loss of public services is however the result of twenty years of neoliberal policy. Public budgets were cut through municipal “debt brakes” and fiscal compact policies. Social infrastructure and public services are privatized while at the same time millions of public Euros are being invested into ruinous major construction projects (Berlin airport, TAV, Stuttgart train station, drills on the seaside of eastern Italy, new incinerators sites, etc) or military investments. It is our task to show that these apparently technical decisions are a matter of political decision and as such to be challenged. Due to these constellations, we believe that right now our reply cannot take the form of one-spot mobilizations to symbolic places such as the ECB anymore, but must be found on the local level. It is there where normalized austerity manifests itself. It is where refugees and migrants have arrived and struggle for a live in dignity. It is where hundreds of “welcome initiatives” do what the state is unwilling to do. It is the local level where the lower social classes are played off against each other. It is where we live, face austerity in our everyday living conditions and act politically. Against this background, our task is to prevent the neoliberal governmental commands of the European elites to be applied in our territories. This means to not only link the local and European dimension discursively, but to empower the local communities inside transnational perspectives and strategies. It is interesting to look at Barcelona and Madrid, and to Rojava in other terms. There, movements have gained the city not only from an electoral point of view but have reclaimed the city through re-appropriation of means of production and living, through recollectivization of reproduction and through forms of alternative institutional structures. Why can’t we think about a wake of the European cities? If we put the power issue (in a time where the formal institutions, the state of emergency, the decisions are defining an authoritarian and anti-democratic political command) on a local level, we directly arrive to question the governance and its layers of powers. We propose it in this way because we think that we have to connect social issues such as basic income, new labour and union rights, with a strong, very political discourse and practice of the conquering of the cities in order to modify them on the base of common needs and desires. How can we gain shape and organise our cities and our lives? Let’s imagine a map or alliance of the rebellious European cities that are committed to a freedom struggle against the appropriation of the neoliberal Europe. This map can be a frame of reference for different initiatives and thematic struggles on a transnational level. We propose that Blockupy calls for participation in those initiatives and becomes active itself as one of many networks highlighting the force of austerity in its local face and consequences. This should be its main task: to provide the transnational perspective and to feed these local initiatives back into the larger European struggle. In Germany the idea of reclaiming our communities translates into the idea of a city for all. 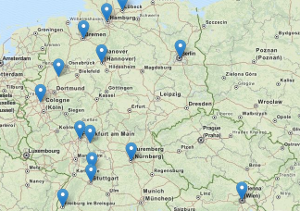 In fact, local “city for all” initiatives have emerged for example in Hamburg, Frankfurt, Leipzig and Berlin. In Italy, Greece, Spain and Portugal, this is a widespread practice already and new forms of collectively organized welfare, cooperation and institutions have developed around it. Let’s think about how austerity concretely shows up in our social conditions and how we can oppose it in our cities and in our lives. Let’s reclaim our utopian ideas. Let’s start to think about how we want to live. How we want to produce and reproduce. How we want to reclaim our cities and our commons. Even if we could be tempted to shift our struggles to the very local level, a transnational practice is indispensable, exactly because what we experience in everyday life is the product of European policies. Authoritarian neoliberalism is a European matter and we shall not become fragmented and invisible in particularistic struggles. We also need points of crystallization and visibility. Therefore, our goal is to be back on the street with an international mobilization in 2017. It is the year of the 100th anniversary of the revolution in Russia. 2017 is also the year of the federal elections in Germany – and in a German-led Europe they are not only a German matter but an event that will influence the lives of millions of people. Latest then, all rebellious cities, “city for all” networks, social coalitions and local and transnational networks should stand united. Together, they form numerous small communes and a vision of an alternative Europe from below. Together, they could become a powerful “Europe for all” bloc able to challenge neoliberal elites. Maybe those in power will set a day X and a place. There is a rumor that a European Conference will take place in Rome where the political elite will debate and constitute new treaties to deepen EU governance and economic integration. The streets of Berlin could also be the center of our rebellion in 2017. It is the capital of German-Europe, of austerity doctrine, the symbol of authoritarian rule over Greece and the heart of Fortress Europe. At the same time it is home to strong social struggles from below. May 1st, the historically unique day of the left, has been raised before as a date. In autumn 2017 the 100th anniversary of the October Revolution coincides with the German federal elections. Let’s disturb their election spectacle all together as transnational movements from below. In a wild referendum on the feet we hold our own election: for an anti-capitalist Europe without borders. Until then, we need different moments of coming together in 2016, too. One intervention to show our alternative vision of Europe could be to join a transnational mobilization to the border of Slovenia and Croatia in spring. Another idea which we want to discuss is to join a transnational bloc on May 1st to strengthen our relations and practice in the streets. No matter where and when: they will not get rid of us since a movement cannot be blackmailed!